Confession: The first Stephen King book I ever read was 11/22/63. 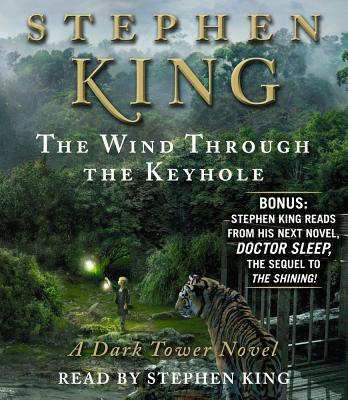 Second confession: The second Stephen King book I ever read was The Wind Through the Keyhole. I listened to both on audio. 11/22/63 was captivating, enthralling, long (but never tedious), detailed, powerful, and imaginative. It left me craving more King in my reading life. So of course, I promptly read 35 odd books not by Stephen King. Imagine my delight, then, to have a change to listen to none other than Stephen King himself narrating the audio version of his latest book, The Wind Through the Keyhole. And imagine my giddy, school-girl giggle when I realized that The Wind Through the Keyhole, while technically book 4.5 of the Dark Tower series, is actually a stand-alone novel that can be appreciated even by readers new to the well-established series. And the second story unfolds, and proves to be the namesake of the novel King himself has narrated. The story-within-a-story is about a young boy seeking revenge for his father's death, which sends him on a quest to cure his mother of her blindness, a quest in which he stands down a tiger, seeks Merlin, stumbles across black magic, poses as a gunslinger... all at the age of 11. Both stories are fantastical and whimsical, and fit perfectly inside one another. King's novel is an ode to the power of storytelling as a means of escape, as a means of entertainment, as a means of conveying messages about life, death, fear, bravery, and so much more. And though King's narration can feel flat at times, it is ultimately impossible to question his delivery--the stories contained herein came from him, after all. The Wind Through the Keyhole proves a fitting tribute to fiction from an author known for his skill with the pen; what's more, it is a welcome return to Mid-World for fans of the Dark Tower series, or a simple introduction to the world to those new to the novels. Novels I'll be sure to add to my TBR list, of course. Note: Thanks to Simon and Schuster Audio for a review copy of this title. Yay! it's always nice when you discover not only a great read, but a series of books to look forward to, too. Glad I could help! I totally understand wanting to go into something blind. That's actually how I tackled this one and I think I was the better for it, since I didn't really know what to expect. Enjoy!